Part of our range of British Standard Kerbs, Channels and Edgings designed to provide edge restraint in pedestrian and vehicular applications. Produced to adhere to the requirements of the current version of BS EN1340. Quadrants are manufactured to match the usual kerb profiles and it's easy to see why they are sometimes known as cheeses. Quadrants are kinder to vehicles tyres on busy car parks than external angles. 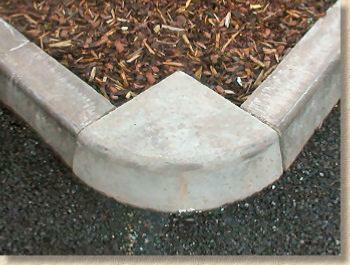 They can be used to connect orthogonal kerb lines, as shown above, or linked to create divider bays within car parks.